This bat has only been reported and caught once on Bonaire, when it entered a house in 1958. It is also found in Venezuela and Trinidad. Some time ago the bat caught on Bonaire was thought to be a different species, A. minor, but further research revealed that the bats all belong to one species, A. centurio. 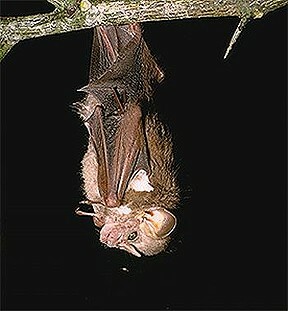 Characteristics of this bat: the length of the head and body is about 4 cm (2 inches), and the bat has no tail. It weighs about 8 g (0.3 ounces). And, being family of the leaf-nosed bats, it has a fine little leaf on the nose. The diet of this bat is unknown, but it probably eats fruits.